Unquestionably, Scotland’s Inveraray Castle is a favorite castle from my British Isles voyage with Azamara Club Cruises. This west coast bastion is exquisite inside and out and is everything you want and expect to find in Scotland. Iconic and a must-see! As the ancestral home of the Duke of Argyll, Chief of the Clan Campbell, Inveraray Castle holds a rich history. If it looks uncannily familiar, that’s because the castle starred as the fictional "Duneagle Castle" for Downton Abbey's 2012 special Christmas episode and filming was on location. One of the many things I love about this property is that the Campbell family still runs the estate. Yes, they still live in their castle in this century, enjoying it with their clan while sharing with the rest of the world. I am grateful to have had the opportunity to see this incredible inheritance while cruising with Perry Golf Cruise via Azamara Club Cruises. The entire estate occupies over 60,000 acres with the castle surrounded by a 16-acre garden. 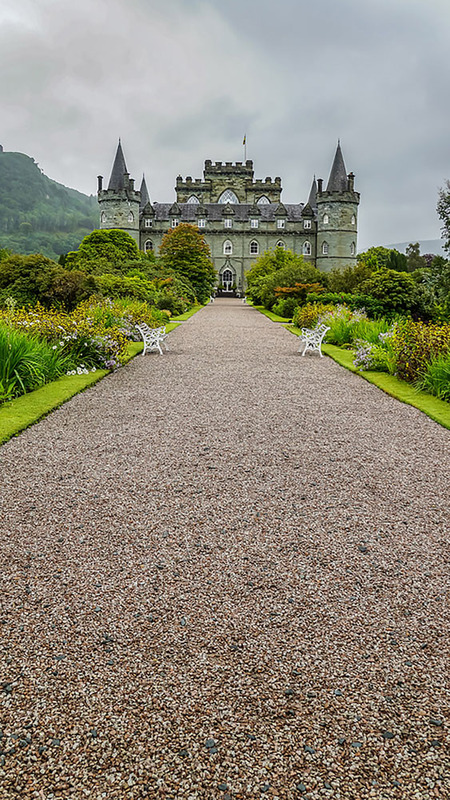 The grounds are reason enough to visit, but you’ll want to budget plenty of time for the interior of the castle, which dates to 1746, though there has been a castle at Inveraray from the 1400s. The castle boasts an impressive collection of more than 1,300 weapons – including pikes, muskets, and swords – throughout the interior. Explore Armoury Hall, The Saloon, and the State Dining Room on the ground floor. Legend has it that songwriters Lerner and Loewe composed some of the score to “My Fair Lady” on the grand piano in The Saloon during a stay at the castle. You’ll find the Old Kitchen, last used in the 1950s, in the basement. There are seven fireplaces in the kitchen! The Clan Room, Gallery, and bedrooms occupy the first floor. If you really love a good ghost story, the walls of the first floor have many tales to tell. The more famous spirits include Grey Lady, a floating ship, and a murdered harpist. I love trying to imagine what life must have been like all those centuries ago. Inveraray is on the shores of Loch Ryne. Making the scene even more picture-perfect is the brilliantly colored garden. No matter the season, something is in bloom adding bursts of color, such as daffodils at Easter and azaleas and rhododendrons throughout the spring. Beyond the garden, the castle grounds offer walking trails, hunting, and camping/glamping. Along with operating Inveraray Castle as an attraction, the Campbell family business includes forestry, hydro and wind energy sourcing, and land leasing. Please note, Inveraray Castle is open to visitors from April 1st through October 31st. I rate a visit to this fabulous place a must. Please plan accordingly. Now that I’m back in the U.S., I realize how much I miss the beautiful British-style gardens. The immaculate lawns, manicured flower beds, and perfectly placed pebbles. Every element is implemented with intention. I really admire that. Not sure, but the gardens may be my fondest memory of my British Isles adventure. What are some of your favorite gardens or castles? On your journeys, where have you wandered that still resonates with you? Azamara Club Cruises visits some of the most picturesque travel destinations in the world and visits breathtaking castles. Ann Tran is a luxury travel writer located in Washington, DC. Ann has cruised with Azamara several times throughout Europe and Asia.